I was pleasantly surprised by how much I ended up liking Don't Kiss the Messenger and was immediately hooked after just a few pages! CeCe Edmonds, the main character, is a strong female and very relatable. Katie Ray has easily won me over with this one. 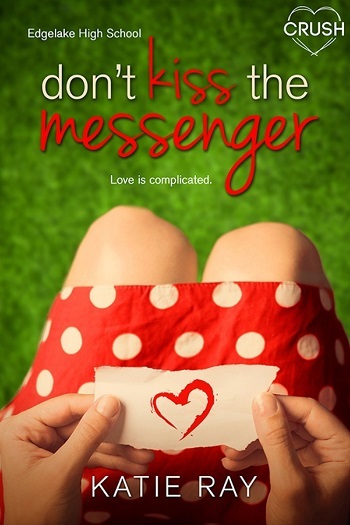 Don't Kiss the Messenger is a modern day retelling of Cyrano de Bergerac, which I haven't read, but I am certainly intrigued by it now. 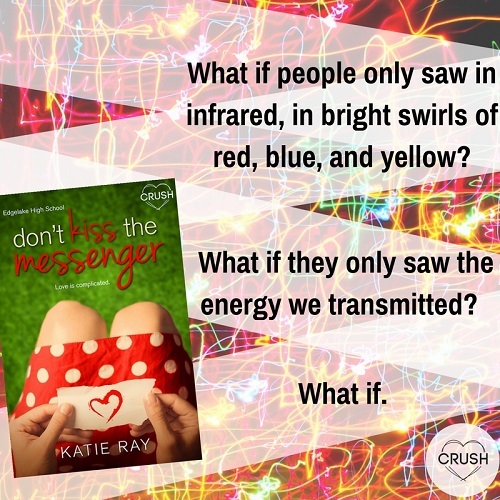 Although this is Katie Ray's first book under this pen name, she has other books under Katie Kacvinsky and I will definitely be looking into what other gems she might have! With a large scar on her face CeCe Edwards has dealt with the stares that follow her around Edgewood High School. However, CeCe never really cared about her looks, at least until Emmett Brady, recent transfer student and star football player, ends up as her partner in literature. But when Emmett sees gorgeous Bryn, a recent transfer and one of CeCe's volleyball teammates, he's immediately smitten. When Bryn comes to CeCe to help her compose messages to charm Emmett she reluctantly helps, but suddenly finds herself falling for a guy who's into the wrong girl. My one complaint was that I think this would've easily fit as a new adult book by tweaking the private high school aspect to a college one to make it slightly more believable, but nonetheless I had no trouble being captivated by Ray's story. I think fans of Colleen Hoover's Maybe Someday will easily fall in love with this story and should definitely be adding this to their TBR piles! 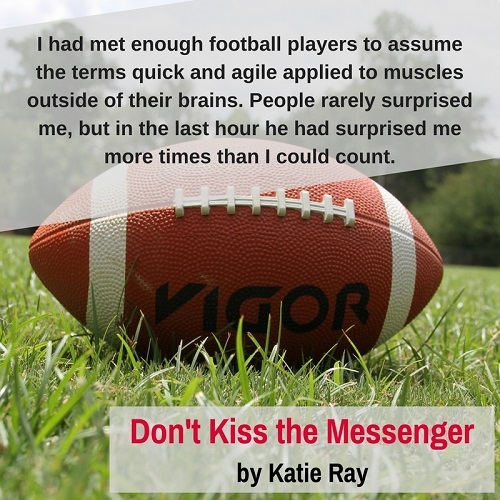 Five Stars for Katie Ray's Don't Kiss the Messenger. Katie Ray is a new-to-me author, and I was instantly hooked from the first paragraph. Swift pacing, easy to relate to characters, and realistic emotions. Beyond frustrating for an adult to read. CeCe is a strong character: athletic, a true leader, crazy about music and literature – deep and cerebral-centric. She is also scarred on her cheek from a car accident as a child. It doesn't matter how amazing she is in all aspects of her life, first impressions matter. Before anyone gets to know her, all they see is her scar. Once they get to know her, their friendship is easy. But the problem is, in order to have a love life, the mating dance begins in the most shallowest of ways... by first impression. CeCe is confident, but relegates herself in the friend-zone, never even daydreaming that anyone would ever want to date her. This isn't a self-esteem issue. Simply looking in the mirror and recognizing who is staring back. I'd love to say this isn't realistic, or that teenagers grow out of the vapid view they have on beauty, but it still holds true from birth to death. A disturbing fact of life, no matter how deep a person we all pretend to be, the bright and shiny attracts us first and foremost. As the volleyball captain, CeCe is friends with her teammates. One girl in particular, a new transfer, latches herself onto CeCe. Bryn is sweet and clueless, but she's even more beautiful on the outside. She's not malicious, just immature and uneducated. I wouldn't say she's shallow. She's a teenage girl, and it doesn't make her vapid because she doesn't want to listen to sonnets or classical music or experience deep, intense conversation during makeout sessions. She just needs to find the right fit, friend-and-boyfriend-wise. Bryn gives the best first impressions. Bryn doesn't have the ability to retain the sparkle after a few minutes. CeCe shines as soon as her mouth opens. Bryn begs her new friend to help her out with the hot guy. Having a crush on the same guy, CeCe knows she doesn't have a snowball's chance after spying the boy eyeing Bryn, so she agrees to help her break the ice. The ice breakage turns into glacier proportions, some of which was difficult for me to read. One sentence by CeCe had me cheering. For all of his intensity, Emmett was the most vapid character on the pages for being blinded by Bryn. Bryn is a great girl, but not what he's looking for, but he was obsessed with the outside packaging. Emmett is the epitome of vapid – because depth doesn't mean deep talks and writing music, it's first impressions and wanting Bryn without knowing her. Everything he voiced, he belied in action. Emmett is a teenage boy first and foremost. His intensity was a bit over-the-top for me to swallow. How a switch was flipped between the cerebral and the physical – if Bryn took a piece of clothing off, Emmett lost 100 IQ points. Hormones. Idiots. He kept saying he wanted love first, yet he kept jumping Bryn's bones. How can someone so intelligent be so... blind? I can't buy into that. It would take 2 seconds to figure out Bryn had no clue what he was talking about, and it had nothing to do with opening up emotionally. No way. No how. If you say you don't like specific genres of music, that isn't an emotion – that's an opinion. But no alarms sounded in his mind when Bryn in person contradicted Bryn in email? He believed what he wanted to believe, saw what he wanted to see... Emmett was a vapid, vapid boy who was obsessed with being in love... the fake, false, romanticized version of love – the fantasy that is NEVER reality... moving on. I struggled while reading the novel, having to repeatedly remind myself that Emmett's a boy. I'm a grown woman, and I know a few things, so for a large part of the novel I was strangling my Kindle, envisioning it was the characters. No matter how frustrated I may have been, their actions/reactions were exactly as idiotic, shallow, and book-cover-deep as human nature predicts. Doesn't make them bad, just human. I don't want to spiral down the rabbit hole where I complain, because I truly loved this angsty gem of a novel. But it was a bit much for my adult mind to find entertaining at times. Teens will go flipping nuts for it, no doubt. Seriously. Too much maturity and too good at everything, almost making them so deep it felt like they were playacting what they thought was sophisticated, highlighting how shallow it was to want shoes or wear makeup and not be involved in intense conversations about music and literature... Yet they were the most immature and blind of the cast of characters. Emmett's friend even told the idiot he was catfished – and I was like, hallelujah! We're finished with this fiasco – Emmett just smiled and nodded his head. The genius Emmett... crawling out of that rabbit hole – apologies. All in all, as I said, I loved it. Teens will find it deliciously angsty. The grown adult in me had a difficult time not shaking the characters and grounding them, teaching them life lessons... because the moral of not messing around with people's emotions and taking responsibility for it was glossed over on the pages... how you're not better than someone else based on your interests... how shaming anyone different is wrong, in order to highlight how right you are... how romanticizing love makes it false emotion. Signing off before the adult in me lets loose. My apologies. I want a book featuring Frank, just saying... I think most of the readers would agree. Girl power! Confession, I loved both CeCe and Bryn, even though I would have a stern talk with them. However, nothing was going to get me to like Emmett. He's the phony type who will repeat this trend for life. That's the grown woman in me talking. Reminds me of Noah from The Affair. LOL! Young Adult age-range: 14+ due to sexual situations and adult language. 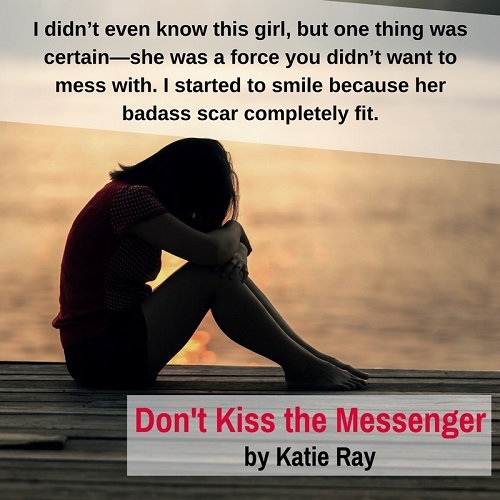 Reviewers on the Wicked Reads Review Team were provided a free copy of Don't Kiss the Messenger (Edgelake High School #1) by Katie Ray to read and review.